2018 VTR National Convention – (Neville) | CTRiumph! The VTR National Convention was held in La Crosse, WI this year, about 1,200 miles away from CT. Jay and Linda Jablonski, your Editor and his Navigator Susan made the trip. Here’s how it went. The sign on the back of Jay and Linda’s luggage rack included the phrase “or bust”. I followed it for hundreds of miles on the way to the VTR convention and the reminder that failure was a possibility caused me to ponder my contingency plans. The most optimistic response to a failure was “fix it by the side of the road”, and to that end Jay and I between us had a fair collection of tools. I had a small collection of spares in the back of the Spitfire, things small and inexpensive enough to take along. Failing a roadside repair, the next option would be to have AAA tow the car to some sort of repair shop that might be skilled in the art of repairing British cars. OK, stop laughing you at the back. The third option was to leave the car somewhere vaguely secure, rent a car and drive back whence we came, to return with the Big Red Truck and my car trailer. My heart sank at the miles and the time this would take. Reaching Wisconsin, and just as important, returning to Connecticut was the only option. No bust. The truck and trailer had been mentioned well before a single mile had slipped behind us. “You’re going to trailer it, right?” was a fairly common response I received when I told people that I was taking the Spitfire to the VTR convention in Wisconsin. It must be said that they had a point. The Spitfire is not really designed for long distance touring and has a number of poorly engineered features that would detract from the trip to some degree. Nonetheless after a protracted rebuild of the differential, driveshafts and rear brakes the Spitfire was deemed ready for the trip. I’m not sure it really was ready as the chronic problem of running too rich hadn’t been sorted out, but I just ran out of time. I don’t know if two cars can really be called a caravan or convoy, but it was good to travel out to Wisconsin with Jay and Linda Jablonski in their TR6. There’s always a bit of safety in numbers and there was also the big advantage that Linda had prepared an excellent road book that detailed each day of the journey. All I had to do was follow the car in front of me with the added security that if anything went awry there was a detailed set of directions to recover the situation. The outbound trip was taken at a fairly leisurely pace with an opportunity to see some sights and visit some wayside brew pubs. It isn’t always feasible to avoid the interstate so we had to deal with I-90 to take us west of Albany but from there on we settled down to some hill and dale miles over US 20. The Spitfire with its meager horsepower rating (Thanks Uncle Sam, you really know how to strangle a car!) needed third gear on some of those hills as Jay’s TR6 with its 6 cylinders started to disappear in the distance, but we made it to Batavia without any drama, preparing to spend the next morning watching water going over a cliff. A quick drive up the road to Niagara Falls got us to the Maid of the Mist tour boat before the queue for the boat became too long and we were treated to a close up of the impressive torrents of water. If I remember correctly on my last visit to the Falls the boats were not operating so this was a new vantage point for me. We then got back in the cars to cross the border into Canada. The temperature gauge on the Spitfire is next to useless since it reads close to the top of the range even when the engine is at a perfectly normal operating temperature, and the electric fan is too quiet to be audible most of the time, so on a fairly hot morning I had to trust that all was well while we took what seemed forever to make our way through the checkpoint. The somewhat humourless border official wanted to know the registration number of the car which proved to be embarrassing since I can only remember the plate for the Big Red Truck. The fact that my guess was only about 25% correct didn’t get me hauled in for further questioning so we regrouped on foreign soil and carried on. Canada treated us to some generous precipitation which revealed another of the Spitfire’s failings. There is a leak around the lower corner of the windscreen on the driver’s side which drips with unerring accuracy onto my left leg, while the seal between the hood and the top of the windscreen fits where it touches, leaving a random array of drips to fall on driver and passenger. After a long enough trip in the rain you exit the vehicle appearing to be incontinent. Frankly you would be drier if you left the hood down and drove with a bit of gusto. The US border guy was as humourless as his Canadian counterpart but at least wasn’t interested in my number plate and we were allowed back into the country for a fairly easy run up to Port Austin, MI. This quiet summer community wasn’t a great place to find decent food and drink but we got by. In theory Sunday should have been a fairly relaxing day with a relatively short drive to Ludington punctuated by two brewery stops. But it was hot. Probably not as hot as, say, Texas but it felt really hot. Here’s another less than desirable Spitfire trait: there are a lot of holes in the bodywork through which engine bay heat can come, the gearbox cover fits where it touches and the exhaust is very hot and warms the floor quite well. The end product is a cockpit that can be unbearable on an already hot day. How GT6 drivers survive is beyond me. I was glad to reach Ludington and crank the a/c up in our room. Monday was cruise day on the SS Badger across Lake Michigan from Ludington to Manitowoc. The Badger was built in 1953 for the Chesapeake and Ohio Railroad as a car ferry and was subsequently converted to a vehicle ferry. You can still see the railroad tracks on the vehicle deck. The Badger is the last coal-fired steam powered ship of any size in service in the US and the 4 hour crossing was supremely relaxing. Lake Michigan was very calm and the breeze most refreshing after the previous day’s baking. All too soon we disembarked and set about crossing Wisconsin. And here was where the Spitfire’s discomfort began. The interstate highways in Wisconsin are fine. The county roads are for the most part fine. The state highways are in very poor condition, ranked 49th out of the 50 states. This is the outcome of political thrombosis: you elect a clot for a governor. I would dearly have loved to have subjected the clot known as Scott Walker to a ride with me. By the time we limped into La Crosse the Spitfire was rattling and creaking as if it was about to return itself to its individual components. The bonnet had moved about so much that there was a big scratch up the passenger side inner wheel arch where it had been making contact with the air cleaner, something which had never happened before. One of the rubber buffers on the bonnet had more or less disintegrated. With every bump in the road there was contact between the exhaust and the frame, there being little clearance to accommodate such rough riding. I set about trying to determine if any of this damage constituted a danger to further progress but eventually gave up trying to use a scissors jack and Jay’s axle stand to get under the car. The scissors jack works fine for changing a wheel but cannot safely raise the car high enough to crawl underneath. I took the car to a nearby service station and asked them to put it on a lift and check out the drive shafts, u-joints and differential mounts. The word was that there was no observable damage and that the car should be safe to drive home. The owner didn’t charge me so I returned the next day with a couple of 6 packs of decent IPA for his help. The convention followed the usual formula of driving events and tech sessions leading up to the show and the banquet on the final day. Susan and I did the funkhana and the gimmick rally but mostly enjoyed the self-guided tours in the beautiful scenery around La Crosse. As agriculture is still thriving in this part of the country there were great views across open country around every bend and over every hill, in stark contrast to the monotonous corridors of trees that characterise many of Connecticut’s rural roads. Linda and Jay took part in more of the convention’s events than we did and achieved some very creditable results, finishing 2nd and 3rd in their classes in the Autocross and 3rd on the Gimmick Rally. Jay’s TR6 took 2nd place in the Concours class for early TR6s while Linda won 3rd in the craft show for her quilt. A car from California edged us into 2nd place in the furthest distance travelled stakes. While all this fun was going on there was unfortunately a problem developing for Susan and me at home, and by Friday morning it was clear that we needed to head east as fast as the battered Spitfire would travel. The return itinerary plotted by Linda was for a more or less direct two-day trip to get back to Connecticut almost entirely on interstate highways. This actually worked in the Spitfire’s favour as the decent road surface and the road noise hid the worst of the rattles. We departed La Crosse at around 11am after saying goodbye to the convention organisers and made good time apart from some lengthy single-lane construction zones in Illinois and the inevitable Friday evening congestion near Chicago. We decided Toledo was roughly a half-way point and made a hotel reservation. The Spitfire had been running well at the 70mph speed limit when traffic permitted but had stumbled badly when restarting from toll booths. The symptoms suggested fuel starvation, possibly caused by vapour lock. Fortunately the car had recovered on both occasions but on leaving I-80 in Toledo the problem resurfaced. This time there was no recovery and at 11:02pm with our hotel just two miles away the ratty little car was dead at the side of the road. I pulled the fuel line off the carb and cranked the engine over to confirm that no fuel was reaching the carb. I also removed it from the pump in case the problem was vapour in the steel line that runs behind the engine. Again, no fuel. I quickly removed the pump and fitted the new spare that I had bought the previous week. Once primed we were back in business and at 11:20 were back on the road. The following day brought frequent showers some of which were quite heavy and cold. Eventually we were forced to drive with the hood up in the heaviest downpours and of course got quite wet from the drips. The car ran well at 70 but when we finally reached home and had to drive on local streets the fouled plugs caused the engine to run very rough. I was happy to get home and shut it down. So was it worth it, and was it a successful trip? On the whole I would say it was. Leaving early meant missing the car show but that’s not an aspect of the hobby that really interests me very much and I had no intention of putting the Spitfire with its dead paint in the show. But while the Spitfire made it there and back I was still disappointed with the car. 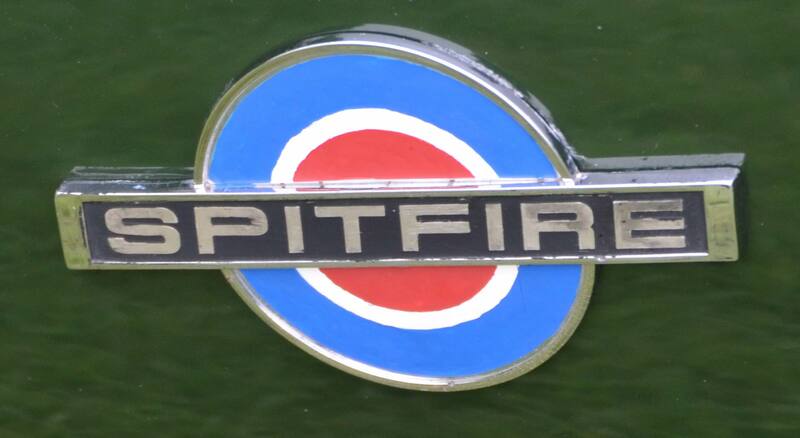 I knew beforehand that the Spitfire was not a very good vehicle for long runs and that what you can put up with on a Sunday afternoon drive is less than fun when you are covering 1,200 miles in two days. My overall feeling is that despite putting in a lot of work over the last two years I still don’t have a vehicle that I am completely comfortable with over long distances. I don’t really care much about its shabby appearance; I do care about all the things that just don’t work as well as they should. Next year’s convention is in Dripping Springs, TX. The organisers have quite sensibly scheduled it for October, so there is over a year to prepare for it!